Now is the darkest hour. Now is the time you must wait on God. The hour approaches when there the light will leave this world. The shadow descends on the Beloved as he cries out, ‘Father, into thy hands I commend my spirit,’ in submission to God’s will. He dies to consummate the redemption of the world. Be astonished in contemplation of this incomprehensible mystery that Life itself should die in order to deliver you from death and to impart to you eternal life. Consider on this day and in this hour, who hangs there dead before your eyes: The Word, the Wisdom, and the Son of the eternal God. He is crucified and dead for the love of each of us. Draw near to him now in spirit and wait at the foot of his Cross, as did his mother. Mourn in prayers of hope and love. Pour out yourself in acts of adoration, praise, and thanksgiving. Above all renew the promises of your heart to be his both in life and death now and forever. One of the thieves that were crucified with him is the first that experiences this miraculous attraction and in an instant is changed into a saint. The captain of the soldiers that assisted at the execution is the next and loudly declares Jesus to be the Son of God. A great multitude gathered, striking their breasts at the sight of what has been done. 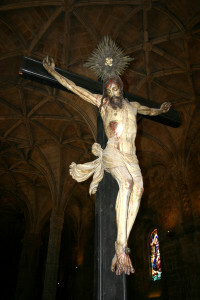 (Luke 23:48) Let your heart share also in this mystery and this mercy by drawing near to the cross. Rest in these dark hours. Be silent and empty of all thoughts except those of the love and victory of your Lord and God.